200 years later... You can say the world has changed a bit. Dragons, Elves, Wizards, and more - fighting it out with Dwarves and Orcs with guns and technology. Will you Choose the path of the Mystical? Or will you choose the Technological? AFTERMATH! Magic! 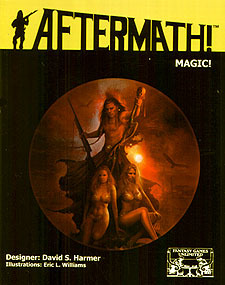 is the essential expansion to complete your AFTERMATH collection. Filled with over 275 spells, mystical races, magic items, and more, AFTERMATH! Magic! allows you to adventure in the world after a magical collapse. What caused the collapse? Where did all these creatures come from? This is left for your players to find out.